Learn everything you need to know about your 46 week old baby. Track important developments and milestones such as talking, walking, growth, memory & more. By this week your baby's balance has likely improved enough that he can stand for a short while without any support. He might not take any steps, and he'll look a little wobbly, but once he's confident in his newfound ability, he'll attempt a few steps of hands-free cruising, then grab on to the nearest piece of furniture as he feels himself lose his balance. Soon he'll start to venture away from the walls and furniture, a step you can encourage by standing in the center of the room with a smiling face and open arms (or a favorite toy). Some babies progress from these first shaky steps to true walking nearly overnight, while others continue practicing for a month or more. That's fine. The average age range for walking is 12-15 months, but anywhere from ages 9 to 18 months is considered normal. Your child understands more of what you say every day and can respond in a number of nonverbal ways. When you mention a toy, he might look in its direction or point to it; if you ask where the airplane is, he might point to the sky. To help him nail down a few key vocabulary words and avoid confusion, focus this week on using a single word to describe an object or person in his life. For example, call your cat "kitty" or by its actual name -- but not both. He'll soon incorporate the words you use into his babbling, although they might not be recognizable yet -- or they'll only make sense to your trained parental ear (such as "doh" for dog). If it's wintertime, you'll also need to take special care to bundle your baby. The general rule is to dress your baby in one more layer than you'd wear to go out in the cold. So in addition to his usual duds, try a bunting over his outfit, or fleece pants and a jacket. And don't forget the hat and mittens, as well as warm socks and boots or shoes, since tiny extremities are the first body parts to feel the cold. It's also a good idea to keep a blanket on hand, in case the temp truly plummets while you're out. It's possible to bundle too much, so if your baby starts sweating or turns red, peel off a layer or two. You know about the possibility of postpartum blues after the birth of your baby, but surprisingly, weaning your baby can cause similar feelings. When you stop nursing, hormonal fluctuations can trigger a mild (or even major) funk. You might feel sad, lonely, or anxious or experience mood swings, crying jags, or loss of appetite. Or you might have trouble sleeping all of a sudden. Be sure to alert your doctor if you feel down and can't shake the blues. Of course, some amount of sadness when you wean is normal. After all, even if you're ready to stop breastfeeding, it can feel like the end of a singular connection between the two of you. You might also feel twinges of regret that your baby's no longer much of a baby. While it's fine to pull out the hospital pictures and reminisce about your little one's newborn days, when he was so sweet, new, and completely dependent on you, weaning is also a great chance to celebrate how much you've both grown together. In just 46 short weeks, your newborn has transformed into a laughing, crawling, talking, clapping little person of his own. Of course, your bond is slightly different now, and your connection will continue to evolve as your child gets older. But independent as he seems, your baby needs you just as much as ever. If you're no longer breastfeeding, find new ways to connect, such as a few moments of snuggle time in the rocking chair before bed. It might feel just as sweet as nursing. 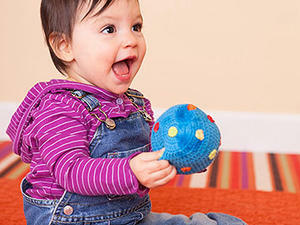 Name your baby's body parts will help increase your baby's cognitive skills.